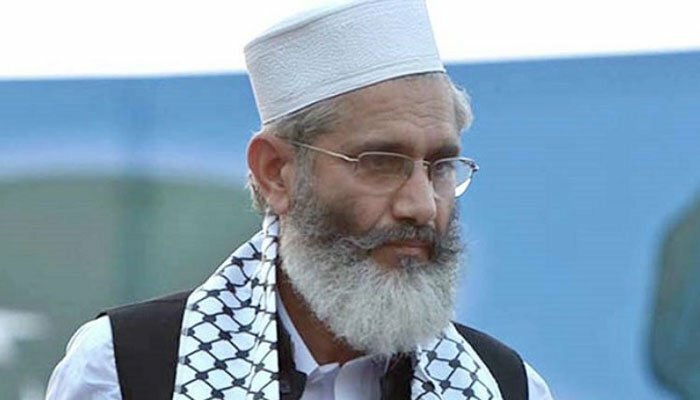 KARAK: Jamaat-e-Islami (JI) leader Sirajul Haq recommended on Monday that the government and opposition appoint Dr Abdul Qadir Khan as the caretaker prime minister as he possesses a ‘neutral personality’. While addressing a rally in Karak, he said that Dr Qadir made Pakistan an Islamic atomic power which is an unforgettable achievement. Sirajul Haq said that General (r) Pervez Musharraf came under US pressure and placed restrictions on Dr Abdul Qadir Khan when India made its nuclear scientist the president of the country. He also congratulated the Chinese President Xi Jinping for taking the presidency charge once again. Talking about the Pakistan Super League, Sirajul Haq said that it is a good omen for Pakistan and that the country needed its chance to watch a good game and be entertained. He said that Pakistan’s current condition cannot get better until the corrupt are present in the assemblies. Khyber Pakhtunkhwa (KP) Senator Mushtaq Ahmed Khan also addressed the rally.